3 June 2010, at 9:10a.m. US - A Purdue University laboratory is getting a steady stream of samples from egg farms as producers gear up to meet the first deadline of a new federal rule requiring them to test for salmonella. The Indiana Animal Disease Diagnostic Laboratory is a testing point for producers complying with the Food and Drug Administration rule that took effect on 30 September 2009. Farms with at least 50,000 laying hens that do not sell all of their eggs directly to consumers are required to meet the first compliance deadline of 9 July. 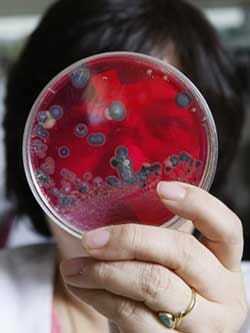 The testing targets the bacterium Salmonella enteritidis, known as SE. It causes fever, abdominal cramps and diarrhoea within 12 to 72 hours. Illness, which usually lasts four to seven days, typically results from eating many uncooked or undercooked foods, including eggs. Thoroughly cooking the foods kills the bacterium, preventing salmonella infection. Microbiologist Ching Ching Wu examines black salmonella suspect colonies from a selective enrichment agar plate. The Indiana Animal Disease Diagnostic Laboratory at Purdue University has found various types of salmonella in samples over the years. The rule was a response to SE contamination detected in so-called environmental samples from egg farms across the United States. These tests involve analysing material from the hen house floor, manure pits and other areas. Detection of SE would lead to the producer testing 4,000 eggs from that flock in two-week intervals of 1,000 eggs each or diverting eggs to treatment, such as pasteurisation, for the flock's lifetime. Since infection comes from a variety of sources, the lab over the years has tested for salmonella bacteria in sick mammals and birds and in environmental samples from locations throughout Indiana. In this testing, the lab has found SE in samples from various sources and other types of salmonella infections in animals, said Steve Hooser, director of the state's Toxicology Section of the laboratory. The lab is receiving a few dozen environmental samples a week. It has not yet received eggs from producers, but the staff has tested a few "to get the routine down," Dr Hooser said. A positive test for SE in eggs would require the producer to divert eggs from that flock to treatment for its lifetime or until four egg tests are negative. The new regulations will require and standardise much of what producers already have done for their own food safety programmes or those established by states since salmonella outbreaks in the late 1980s, said Paul Brennan, executive vice president of the Purdue-based Indiana State Poultry Association. Indiana is the third-largest egg production state in the nation, with 26 million layer hens. Producers have been fighting salmonella by voluntarily taking such steps as disinfecting poultry houses and intensifying rodent and pest control programmes, Mr Brennan said. Because of that, he does not foresee the rule significantly reducing cases of food-borne illnesses from SE. "I think that a lot of the work to reduce SE in the egg industry is already in place," Mr Brennan said. Operations with more than 3,000 layers but less than 50,000 have an additional two years to comply with the new rule. Farms larger than that must comply first because they produce 71 per cent of the eggs sold to consumers, and it is economically more feasible for them to adopt the regulations, the FDA said. Farms with fewer than 3,000 layers and those that sell all of their eggs directly to consumers are exempt from testing. Such operations, typically family farms and farmers markets, represent about one per cent of the market. The rule also sets refrigeration requirements for holding and transporting eggs. Egg producers are committed to providing a safe product in the best interests of consumers and because the presence of SE could cost them hundreds of thousands of dollars in replacing hens and ridding the poultry houses of contamination, Dr Hooser said. "They are the most interested people in terms of having salmonella-free eggs," he said. "It is a huge commitment for them. They are concerned."